Villupuram: Mass Run Event was organized on 19.9.13. 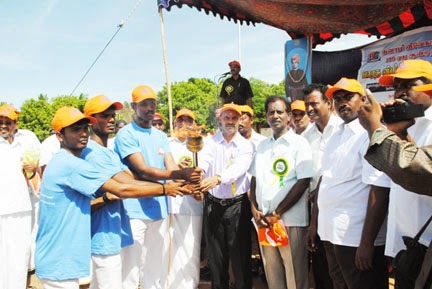 District Collector V Sampath IAS flagged off the event and DIG Dr. S Murugan IPS addressed the gathering. E. Swamikannu, Chairman E S Group of Institutions presided over the function along with R Batcha, Principal of Ramakrishna Vidya Mandir Hr. Sec. School. District President S Thiyagarajan, Correspondent of Swami Vivekananda College, District Member S Senthil, Secretary Theivannai Ammal College was also present. 1230 youth ran for the nation.